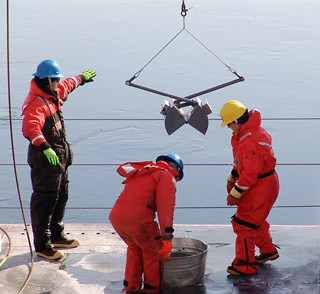 To deploy a Van Veen grab sampler, a scientist props the instrument’s metal jaws wide open and drops it over the side of the ship. When the sampler hits the seafloor, the two halves scoop together to grab a sample of sediment. It can dig up to 20 centimeters (about eight inches) into the surface. Once it’s closed, scientists pull it up to the ship, dump the sediment into a bucket, pour the sediment on a sieve, and spray it with a hose to wash the sediment and leave behind the tiny animals. On this cruise, the most common little animals in the sediment will be clams, polychaete worms, and amphipods (tiny crustaceans).